This might not sound that great, but the most romantic thing my husband John and I ever did was go canoeing on the Silver River near Ocala, Florida. We stayed at a friend's cabin in the forest, at Salt Springs, which was really beautiful. It's a pine forest with lots of deer, bears, all sorts of wildlife and beautiful birds. One morning, we got up and went and rented a canoe, and went up the Silver River, all the way to Silver Springs Park. It was absolutely gorgeous, and so romantic. We went early in the morning and there was no one else on the river yet. It was totally quiet and peaceful. No signs of civilization. I felt like I was in a prehistoric rain forest. John loved all the different birds we saw. We were blown away with how beautiful it all was, and then we saw the monkeys! The story goes that in the 1930s someone brought a bunch of Rhesus monkeys to the park there to help with the tourism. The monkeys escaped and have stayed there for generations. 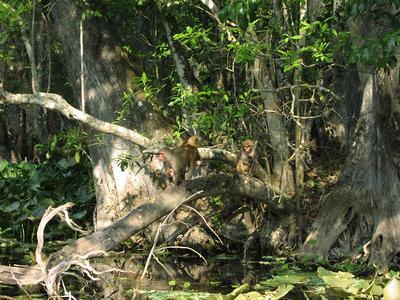 When you go past on the river, the monkeys all come down there in a group, looking for food. We threw them some pretzels, which you're probably not supposed to do. There was about 20 of them, babies hanging onto moms. It was soooooo cool! See the picture. We also saw several big alligators sunning themselves on the banks, and hundreds of turtles. Canoeing the Silver River and staying in the Ocala National Forest at Salt Springs was definitely the best vacation we ever had; the canoe trip was the MOST ROMANTIC! We live in Florida and took a flats boat up the Silver River. We saw the monkeys, too! And fed them oranges, they peeled them! We stayed at Elite Resorts RV part in Salt Springs (google it). What a beautiful area. We thought it was romantic, too. Why do people feel the urge to feed wild animals ? Don't they know it is illegal to do so ? Idiots. Feeding them makes them less wild. Leave them alone. They may be wild animals, but they shouldn't be there. If you want to complain about messing up nature, then why not just say remove the monkeys? For one I think it's pretty sweet. Thanks for the story. These monkeys were brought to this part of the forest decades ago by MAN. There really isn't the right type of food in a pine forest to feed them. Tourists on the river have been feeding them for many years, and they are so tame they come down to the boats looking for the food. I think this is a case of lending a helping hand. We did the monkeys wrong by placing them in the wrong habitat many years ago, and now the least we can do is help them stay alive. Join in and write your own page! It's easy to do. How? Simply click here to return to Romantic Getaway.